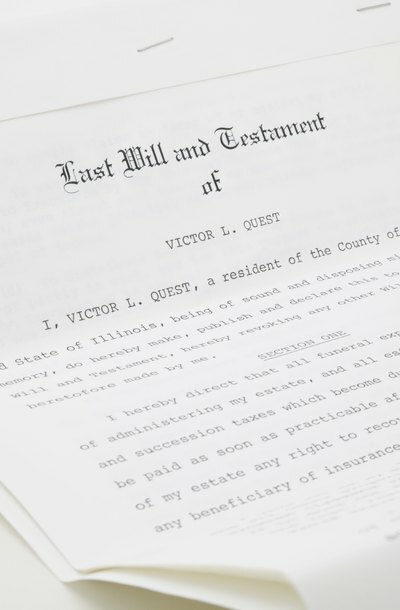 When a person executes a will, he usually names a person he would like to administer the estate after death. This person, known as the executor, is responsible for distributing assets and paying debts. Upon death, the executor submits the will to the Surrogate's Office. From there, the executor must notify beneficiaries of the death by sending copies of the will to each. The probate process, in general, involves dividing assets, paying debts and satisfying taxes of the decedent. The executor is responsible for notifying creditors that the debtor has passed away. Notification must be made in writing to each known, valid creditor. New Jersey law imposes a nine-month time limit within which a creditor must make a claim against an estate. The nine months begins on the date of debtor's death. The executor cannot distribute assets to beneficiaries until all claims are satisfied. If he does, he may be personally liable to the creditor for the debt. Under New Jersey law, there is a certain order in which debts should be paid. The executor should first pay the bill for reasonable funeral expenses. Any costs or fees associated with administering the estate should be paid next, followed by debts and taxes. Medical expenses from the decedent's last illness are paid next, then judgments or liens. Any other outstanding debts are paid last. The executor is free to dispute any claims against the estate and must do so within three months from the date the claim is made. Creditors may also be willing to negotiate with the executor for payment of a lesser amount. If a person dies without a will, he is considered to have died intestate. In this situation, New Jersey statutes will direct the payment of beneficiaries and satisfaction of creditors. The Surrogate's Court will appoint an administrator to handle the administration of the estate. The administrator must then begin investigating the decedent's personal effects, including bank statements, veteran's benefits information or medical bills. The administrator must pay debts in order of priority, beginning with the funeral and administration costs. Certain financial accounts are not subject to probate and are not accessible by creditors. For example, insurance policies with named beneficiaries, payable-on-death accounts and 401(k) accounts are all non-probate accounts and funds from these cannot be used to pay creditors. These accounts pass immediately to a beneficiary upon death. In contrast, checking and basic savings accounts are accessible by creditors and are not protected from probate. Many deadlines follow a person's death as his estate is being probated in California. Probate is the process by which courts make sure that a deceased person's debts are paid and property distributed to his heirs. Deadlines in this process must be satisfied in order for the process to proceed smoothly. Probate only applies if the combined value of the decedent's real and personal property are greater than $150,000 at the time of death. If the estate's assets are less than this, these deadlines are irrelevant. What Does It Mean to File a Suit on an Estate? People often leave behind property to distribute, taxes to pay and debts to settle when they die. These unresolved issues are known collectively as the deceased's estate. Various creditors may come forward to claim repayment of debts from the estate, and the personal representative is responsible to pay those debts. But if he refuses a creditor's claim, the creditor may then file suit against the estate, meaning that he asks a court to compel repayment. Are There Time Limits in Will Probate?